In Roma today. Well, I arrived yesterday around noon on the train, which seemed to be in tunnels most of the way. Made my way to my little 2* hotel by the train station (great place!) then over to the Vatican Museum. As I would rather be out exploring Rome today than writing this (no sleepless nights to write this), here are some photos from The Vatican and Rome. I woke up with the idea of going to MOTAT, the national museum of transportation for New Zealand. On two sites along with a zoo and parkland, it sits about 15 minutes by bus from the CBD. The museum has a rich collection of transportation artifacts, but really is in need of some curation. 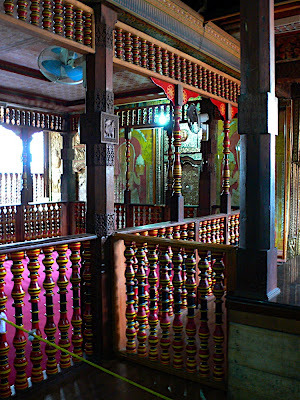 It has the feel of a community museum, not a national museum. Artifacts are added and shown not necessarily for any reason other than that they were donated to the museum. Quality pieces are buried by flotsam. How this can be handled better is what the National Railway Museum in York, England, handles this. As the repository of the relecs of the pre-nationalized railways of Great Britain, it holds a vast collection of artifacts of limited interest. Instead of burying the main pieces with these artifacts, they keep them well documented in back rooms – which are open to the public. Anyway, even without this, I enjoyed a good 3.5 hours at the two sites – connected by historical tram. Very hard to take photos tho, as it was so stuffed together. Had a quick bite overlooking the water and continued wandering the city, finding a fine Microbrewery (The Shakespeare Inn), going out for supper on the water, and calling it an evening. Up the next morning and off to the airport, for my flight to Venice via Bangkok and Frankfurt (Thai and Lufthansa). Listening to some French pop music, but not using my Bose earphones. On my Singapore flight to AKL, the seat ate the cable. Luckily, I have a spare, unfortunately, it is at home. Flying over the Timor Sea at the moment, about 4 hours out of BKK, listening to a mix of Arabic and French pop. A few CDs to buy are now on my list. This is my longest flight of this trip, beating the flight to Amman by 45 minutes. I will have to say this flight is a bit more comfortable. Basically, that is Queenstown in three words. From the architecture to percentage of Japanese, from the mountains to the gondola Queenstown is basically Banff at 1/3 size. Well, other than it is not in a National Park. 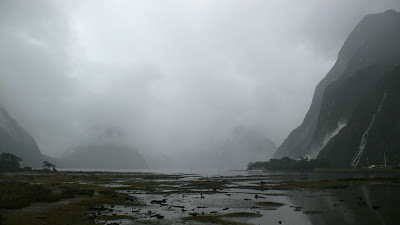 That is 250km away, in Milford Sound. It is rather interesting how a a commercial district in a small mountain town can take something that looks unique and beautiful and turn it into another generic tourist village – Jackson Hole, Whistler, Queenstown, Banff – they all look the same in the end. Here are some photos from the trip down, they look dark on a PC. I have some better ones, but they need some work. Off to Auckland today, hopefully the internet won’t be as expensive and or slow. I find that the internet in NZ is some of the most expensive and slow anywhere. Twice as expensive at the hotel as in the Hilton in Colombo! Woke up very early again to get to Colombo. The train left at 6:15 so I wanted to leave the hotel by 5:30. All the lights were out, I woke up the front desk clerk from a nap – he was very apologetic. I told him not to worry, I would rather be sleeping myself! They called a tuk for me – no negotiations this morning on fare, as he knew where he had me. A quick cool ride to the train station before the sun rises, so cool in fact that the windows are not even open in our coach. All baggage is searched as we enter the station. I board my coach, noticing the only real difference between 1st and 2nd class is that the seats are a bit closer together, and do not recline. On the other hand, the seats are wing back, which makes napping easier. This activity is what most everyone on my coach does, after eating a takeaway breakfast. I am luckly sitting on the other side of the train this time, so I can see a different view – even if for most of the ride my view is the side of a mountain. We go down the hill to the plains, it is a 1:44 slope, not that great, but I do notice what looks like two run away tracks at stations. They arch off the main and go up quickly against the grade. By 8:50 I am in Colombo – entering the station at full commuter push. The air is still cool-ish (maybe 30) so I walk to the hotel. It is only 3 blocks and 15 tuk ride offers away! I enter again the coolness of the Hilton and ask for an early check in. Given the 35% occupancy rate, it is given. Plus, I am upgraded to an executive floor. Score. I decide to have a walk in the old city. 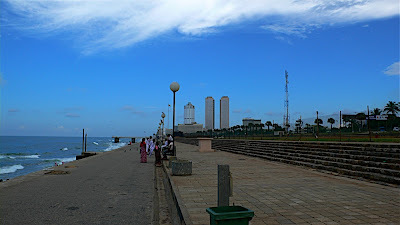 Not much to see there really, as it is pretty much security checkpoints, so I head to the Galle Face Green. It is a nice walk up along the Indian Ocean, watching the ships on the horizon. I chat with some kids off school for lunch, who are playing in the ocean, showing them some photos I took. It was really nice to talk to some people who just wanted to chat and practice english, and who did not want anything else. Had lunch in the new commerical district south of downtown, and then walked back to my hotel. I am pretty sure I looked like some kind of steamed meat – i know I felt like it! That evening I took drinks and dinner in the lounge – as it is all free – and watched the sunset from the 19th floor. Had after dinner drinks with a couple of technical people from Singapore until late in the evening, forgetting that I had an early flight out. Up early the next morning, already checked out. One hour hotel car ride to the airport (fun to be in) and I am checked in. The flights and my tickets work!!!! 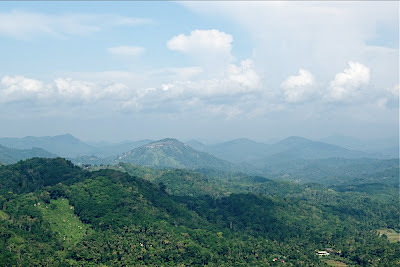 The trip to my hotel in Kandy takes about 30 minutes, as it is actually south of the city, overlooking the Mahaweli Ganga (River). It is still rather early, but as the hotel is mostly empty, they check me in. My room is nice, but is a bit worn around the edges. After unpacking and a quick shower, I have a Coke in the lounge, which has a wonderful view. I call for a Tuk, and I make my way into the city. Kandy feels about 5 C cooler than Colombo, as well as much drier. 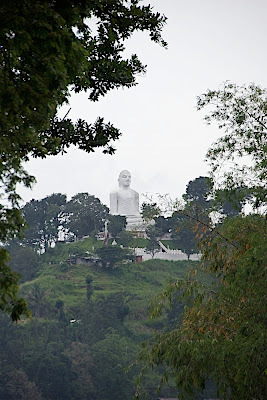 The city is dominated by Kandy lake – a man-made lake built by the last King of Kandy – the last kingdom in Sri Lanka. Overlooking the lake is both downtown, and the Royal Palace and the Temple of the Tooth, or Dalada Maligawa. This group of structures were built over the last 200 years, but some of the temple was destroyed by a bomb 5 years ago — since rebuilt. The temple itself was very impressive, with many different buildings of different ages. I took some photos, but thy didn’t turn out very well. It is an active temple, and while photos are allowed, I decided to minimize it as not to impose too much on those who were there to worship. The tour itself, which was rushed, took about 2 hours! At the end my feet were sore as you mostly walking barefoot, and generally tired from the early start. About the touts. Generally every couple minutes a single man would appear, walking with you starting a conversation. Such as, I am a cook at your hotel, or something similar. It got tiring after awhile. I don’t begrudge them, I have money. It still is tiresome having to ignore people, which is something not really in my nature. I imagine if I was not traveling alone it would not be as bad. After finding a bank machine, I went to the town market, to shop for clothes. I bought three polo style shirts, one Polo, two Lacoste. Funny thing, everyone mentions how Lacoste is cheap in Sri Lanka — well the shirts I bought were made in Peru! Matthew, how were the shirt prices there? After my purchases, I was rather wiped. My options were to go to the Elephant Sanctuary or the Botanical Gardens. I had little interest in walking with the elephants, so I was about to go to the Botanical Gardens when it started to rain a bit — nix that. Instead I went back to my hotel for a nap and drinks as I watched the sun set over the valley, which was very pleasant. To bed early as I had to be up for 5am to make the train back to Colombo! 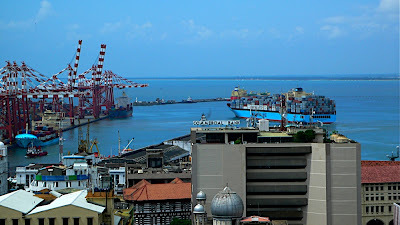 Back this afternoon to Colombo – actually I have been back since this morning, but nonetheless, it is afternoon, I am in my hotel room after a long walk and a shower, writing up this note. 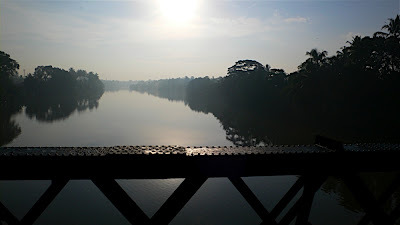 I wish I could add more photos to this, but my photo taking ability is hindered both by the overt security force placement here in Colombo, and my loss of photo taking skills in Kandy. 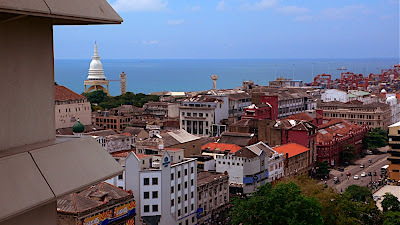 The first night in Colombo, I ate at the hotel, as they had a Sri Lankin restaurant – which was quite good, and rather hot. One of the servers was very helpful in telling me how to eat each dish, and what each one was. 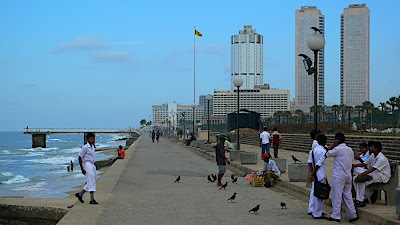 After dinner, I went to a walk along the Face Galle, a long park and sea wall. The weather was pleasant, only 26-28. After the walk, I took an early evening after a nightcap as the train was leaving early in the morning. Up and checked out by 6:30, for a short tuk ride to Colombo Fort station. Wonderful light and archetecture, but as I was not wanting to get security forces in my photos, my opportunities were limited. A couple of shots with my handheld unfortunately did not turn out. 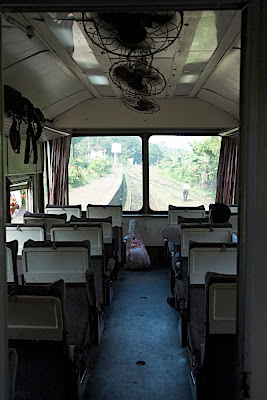 The train left promptly at 7:15 speeding through the northern suburbs of Colombo. Every few minutes a train would pass by southbound full to the gills with commuters. These trains were traverse seating, with many large doors, with a motor engine at one end, and a second driving cab at the other. There was only one other European in the car — from Germany. The rest of the 1/2 full car were Sri Lankin. For the first half of the trip we sped on a double main-line, CWR (continuously welded rail), with concrete sleepers (ties) – infrastructure not unlike what we have on our main commuter lines. We were rising slowly (each station has a mean elevation noted) from sea level to 50m. Then the line split, and after the next station we left you quickly realized you were not on the main line anymore. What was before CTC (centralized traffic control) moved to station towers, with mechanical interlocking, with mechanically operated semaphores! As well, most crossings were manned, and manually lifted and put in place. 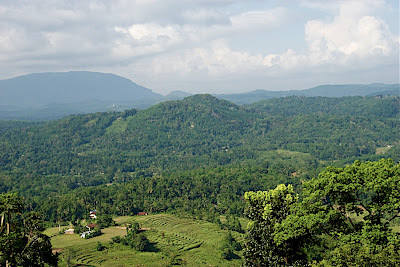 For the next part of the trip, we went up the side of the mountains to the highlands around Kandy. In 30 minutes we went from 50m to 500m, though 8 tunnels. 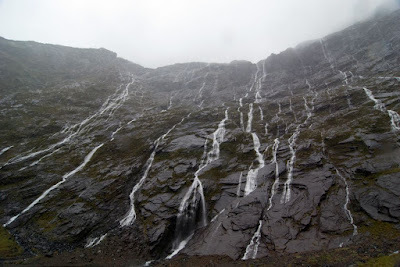 It was a rather spectacular climb. Eventually we make it to Kandy. 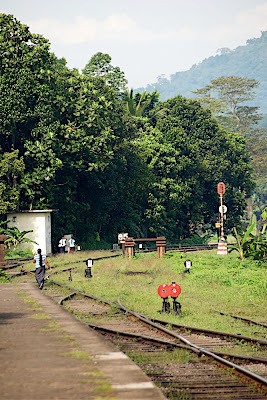 The station is a terminus station, with a junction to the line farther inland a few km from Kandy station. Outside the station grounds are teeming with tuks and busses. I grab a tuk and for more than the price of my train ticket, I am off to my hotel, which is actually outside of Kandy. 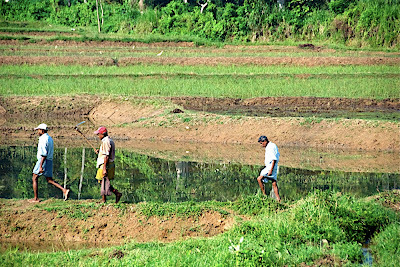 The noise in Sri Lanka is amazing. Horns, yelling, cars, exhaust, all at 10. And the exhaust. 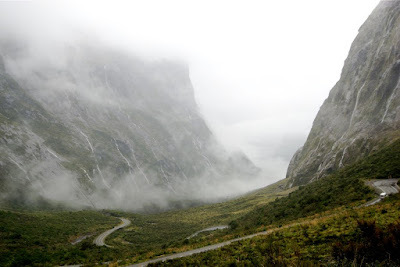 I cant imagine what the respiratory illness rates are here…. Dad, I think this airport has changed since you last were here. It is actually not bad. 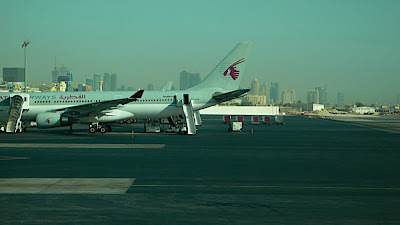 I could not get my earlier flight, so I did in the end stay over at the Marriott Doha. A very nice hotel. Great service. 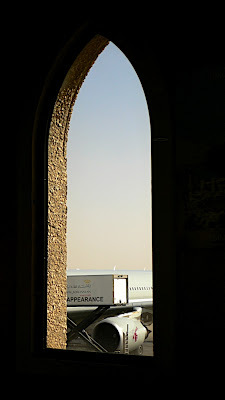 The relative culture shock of flying from Amman to Doha – 2 hours – was more striking than I imagined. Jordan is poor, not Africa poor, mind you, but definitely not Doha rich. 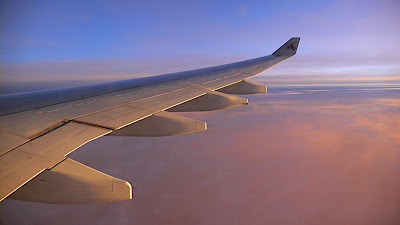 But I think what most struck me is the difference in service between between two Marriotts – Petra and Doha – which I think speak a bit of the two cultures. If, of course, lots of money is a culture. In Petra, when you went to a restaurant, there were allot of staff, but one quickly found the service wanting. It seemed that all the staff really wanted to do was lean back and have a smoke, and would only do something if yelled at by their immediate supervisor. Of course, the big issue is is that the supervisor really just wanted to lean back and have a smoke, unless of course he was yelled at by his supervisor. I think the General Manager of the Petra Marriott was leaning back having a smoke. I decided to try to see what would happen if I yelled. The afternoon after seeing Petra, I decided to sit on the balcony over the mountains writing postcards, having a Pepsi Diet, and maybe a late lunch. An hour after the first Pepsi and no sign of any staff interested in helping, I went and yelled at the front desk. Not too loudly, or too much, but I did yell. I then went to my room for a nap. When I came back that night, I noticed an improved level of service. The Marriott Doha was, on the other hand, generally has a culture of buying the best service they could from around the world. The owners laid down a list of what they wanted, and they would pay of it. You had a feeling that if you they did not get it, they would just go out and pay someone else for it. Even given that, service felt warm and genuine. Talking to the restaurant manager, of all the countries he had worked in, he found Qatar the best. 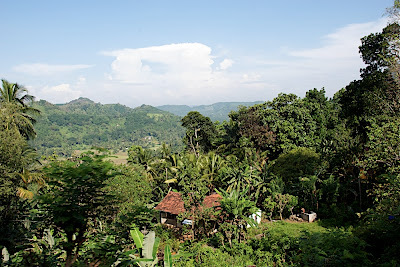 Up next is three nights in Sri Lanka, with a day in Kandy if I can arrange transportation.